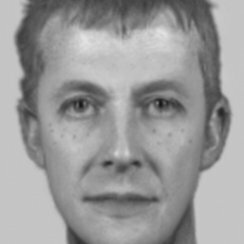 Police say a young schoolgirl has helped them to make an e-fit of a man, who tried to abduct her in Hyde. The 11 year old girl has worked with specially trained detectives to help put together the image, which police hope will help find the offender. Around 12.05pm on Saturday, the man walked into the garden on School Lane, telling the girl he was lost. As the girl came forward, the man tried to grab her left wrist. The victim screamed and kicked out at the man, who then ran off. He is described as being a white man in his late 40s, about 6ft tall and of slim build. He had short blonde hair, a deep voice and spoke with a local accent. He wore a heavy black coat, blue jeans and black trainers which are described as having orange markings on them. The girl ran into the house and told her parents who called the police immediately. Detective Inspector Richard Hunt said: "Since this incident, we have made a number of enquiries to help find the man responsible so he can be apprehended as soon as possible. "Understandably, there has been concern among residents about what has happened. We are working hard to reassure our communities that we are doing everything we can. "As such, patrols in the area have been stepped up, and we are also working closely with local schools in the area.